This was at lunch yesterday with my friends that I had written about in my earlier post on our neighbourhood Irani Cafe. 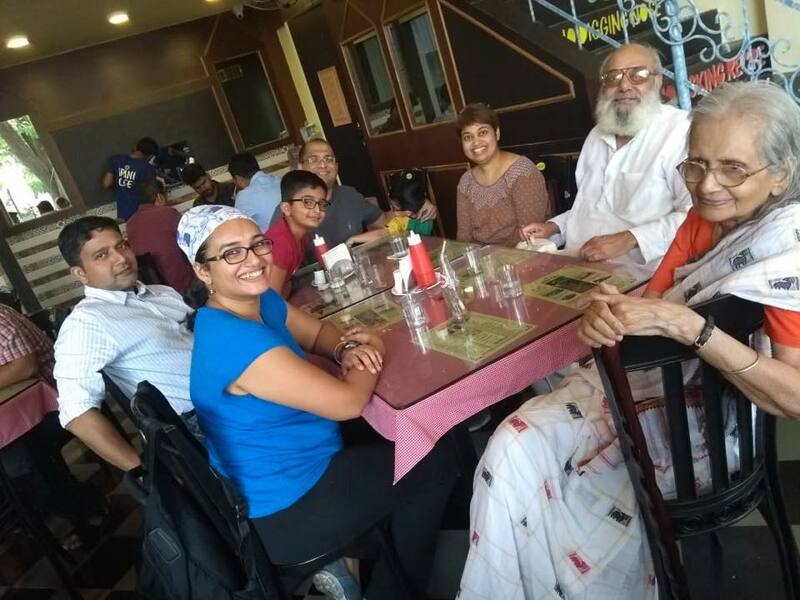 My hosts were, the young lady Deepali, sitting next to me to my right and her husband Sandeep, sitting at the bottom of the table. The young couple sitting opposite to me Rekha and Sanjeev, are visiting Pune from Mumbai and joined in the festivities. You can also see Rekha’s and Sanjeev’s two young sons Aniruddha and Aryaditta in the picture, as well as Sandeep’s mother sitting to my left. The occasion was Sandeep’s birthday. I had gone earlier to the restaurant to arrange for setting two tables together as otherwise they offer only four seaters. When the group alit from their car I went up to the entrance to receive them and Rekha who was coming up first greeted me warmly and said that she had met me earlier many years ago. For the world of it, I just could not remember having met her and her husband earlier but let it pass with a casual comment that it was so long ago. It took me the entire afternoon before I remembered where I had met Rekha and Sanjeev before. It was about nine years ago at Deepali’s and Sandeep’s home for dinner. The former were visiting and staying with them. Little Aniruddha was a babe in arms and the younger lad Arymaditya was not even a thought!. I sure am getting old! This entry was posted in Blogging, Family, Food, Friendship, Raves and Rants, Relationships and tagged Birthday celebration. Bookmark the permalink. I now have trouble with both names and faces and I’ve been so great before. Some come up to me all greety and jolly and I find out they only know me from theatrical/writing events. Hard to place but it frightens me some time. My friend L has good days and bad days but when I chat with her, and I’ll be staying with her for a week soon, I feel so grateful and so patient as she painstakingly writes every single thing down. I think our gaps are normal Ramana. Though frustrating at times. The group came visiting me at home last evening and when I shared my dismay with them, Rekha was most diplomatic and said that since it was about nine years ago that we met first, it was understandable. I was and am relieved. I also accept that such gaps are normal though frustrating. Getting old? Aren’t we all. 😀 Great picture. Thank you! The waiter who was looking after us was thrilled to be the official photographer and took many from which Sandeep chose this one for publishing. Thank you. I would have said “Welcome to the club”! It’s very frustrating when I recognise someone’s face but I can’t for the life of me remember their name or where I met them previously. And it’s embarrassing when they recognise me but I can’t recall ever meeting them. It’s partly old age and partly just a life-long lousy memory. My sister on the other hand has a photographic memory and remembers every little detail of every passing event. For me, it is a recent phenomenon that I cannot recall old faces and / or names or the combination. I suspect that modern social network platforms have made it difficult with just too many old contacts reappearing in our lives. I think as you have had Ramana, a long and colourful life – colourful in being out there in your working life and being within many communities – there are sure to be people who remember you, but not you remembering them… especially since you are meeting them in totally new surroundings like your encounter with the young family at someones’ else home more than 5 years ago. I wonder can you remember what was served at that dinner…possibly. As you know I just connected with someone not seen for many years via dear old f/b and only from a small comment on someone elses’ page..
Funnily enough, I can remember the dish made that night as it was specially made for me! In any case, it all came back later.